This is my entry for Just Cute Bears challenge #15 - Buttons and bows. I haven't used proper bow as I just couldn't get them right so I hope these knots? will be OK. The buttons I cut off my daughters school shirt, luckily she has grown out of it, (more new clothes, I do wish they would grow a little slower). The paper is a K & Co 6 x 6 paper pad 'Amy Butler'. I have put a big gem in the middle of the balloon. 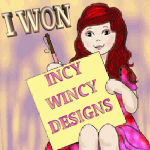 The image is by Sliekje at Sliekje's Digital Stamps. I love Sliekje's images and they are all free. I hope everyone had a good weekend and has a good week to come. 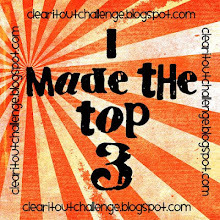 hi honey, i had to laugh reading what you have written.... about knots and shirts.... hihi. Oh Poppet it's lovely I love how vibrant it is and that bear is just sooooo cute! I love K & Co paper too! Aaaawwww! So Cute! i know what you mean about kids growing too fast. My boys school stuff is starting to shrink, but I he changes schools this year so I begrudge buying any more for this school. Such a gorgeous card Poppet. I love the image and the papers are so pretty and summery. The bows look great to me and I love the buttons, always a great way to recycle! Sweet card, beautiful colours and details. This is really sweet Poppet. I have to admit to always cutting buttons off too. My Mum always had a button box! 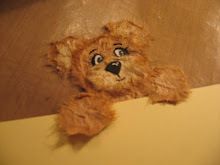 A very cute bear! 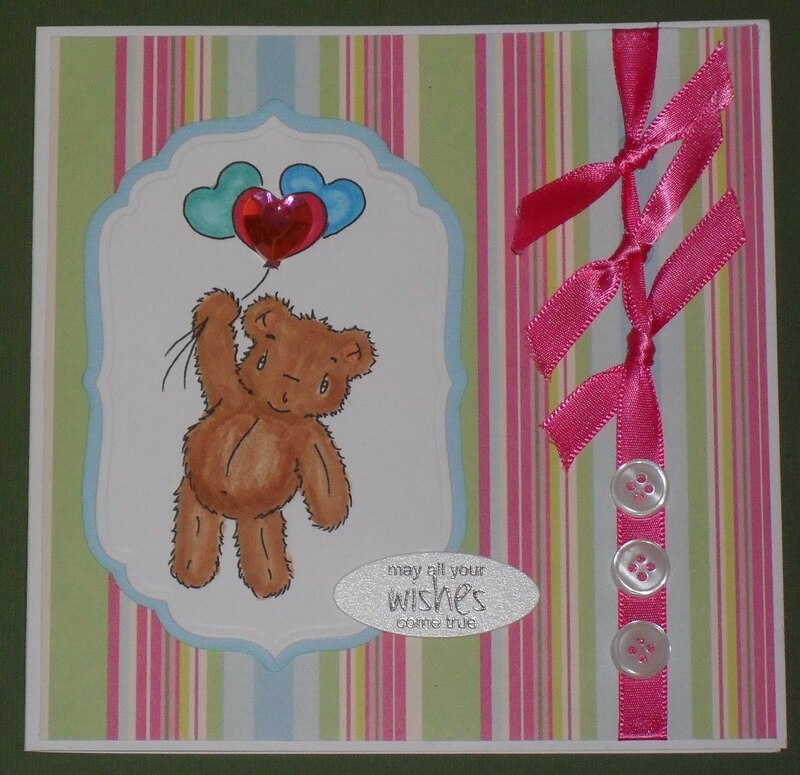 Love the pretty pinks you used for your card and I love the buttons you used too! 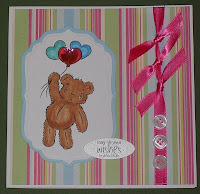 Adorable bear and love the pinks you used for your card! This is lovely.Thanks for joining us at Just Cute Bears. such a cute teddy bear! thanks for joining in with us at Just Cute Bears.